Movement: Automatic, self-winding, mechanism; ensuring that as long as the watch is worn it remains charged. Dial: Patterned white dial with cursive number hour markers. 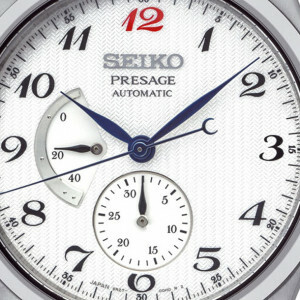 The numerals, Blue hands and sub dial are inspired by the original Seiko Laurel watch from 1913. 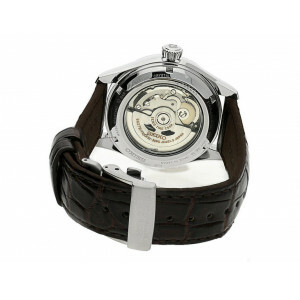 Back: See-through caseback is fitted with premium sapphire crystal. Admire the see-through Seiko movement with 29 jewels and gold engraving on the rotor. 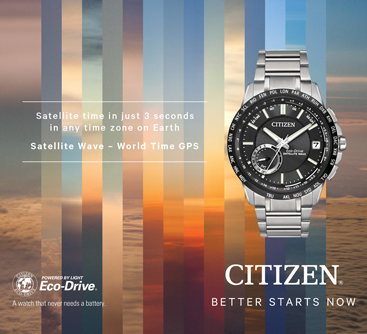 Functions: The aperture at 9 o'clock displays power reserve (Approximately 45 hours ). 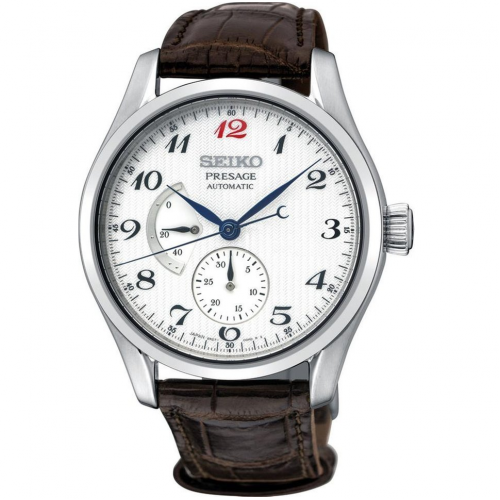 Note: Seiko have updated the design for this model. The previous model (SPB041J1) did not have Pesage written on the dial. The new model(SPB059J1) has Presage written on the dial.